Editor's note: Watch this month's Talk Asia from Feb 20 for Monita Rajpal's full interview with Gigi Chao. (CNN) -- What's life like when your father is a billionaire, your mother is an actress, and your sexuality becomes an international headline? Just ask Hong Kong businesswoman Gigi Chao, 34, who says she "didn't have time to be shocked" when her father, real estate tycoon Cecil Chao, discovered her lesbian marriage and then offered HK $1 billion ($128 million) to any male suitor in the world who could effectively turn his daughter straight. Overnight, Gigi's phone was flooded with messages from suitors around the world -- attention she never wanted. "There wasn't really an opportunity to mope -- 'Oh, poor me, I got thrown out of the closet,'" she says. "There were all these factors out of my control. I thought, I have to be my own rock." Two weeks ago, Chao defended her marriage with an open letter to her father, writing, "You have no idea how happy I am with my life." Her father dropped the dowry the next day. Her parents still refuse to welcome her lesbian partner. But by coming out, Gigi Chao has touched off a society-wide conversation about the difficulties facing lesbian, gay, bisexual, and transgender-identifying Hong Kongers as they try to find acceptance within their own families. "It's a belief that coming out as gay is a blatant disrespect for your parents," says Chao, speaking about Chinese culture. "But it's not that way at all. Most gay people I know respect their parents very much." Raised in a strict family, with a tycoon father who made her enter university at 16 and an actress mother who was a "perfectionist" about her daughter's appearance, Chao says she learned from an early age to hold back parts of herself, including her own emotions. Chao recalls an instance when, as a teenager, she brought her girlfriend to her house. "My mom... cried and screamed and banged her head against a wall and said, 'I will never accept this fact about you, and I'll never accept it 'til the day I die.' 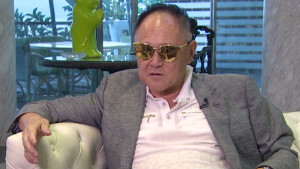 So I just sort of sat there in silence, and took it all in," says Chao. "The best way... is to be grounded and logical about it -- ground yourself in reason, you have to be a combination of a good actor and a good lawyer at the same time," says Chao. Chao says her family's reaction was somewhat typical of the socially conservative Asian society. There's a belief that coming out as gay is a disrespect for your parents, but it's not that way at all. "A lot of what Hong Kong is, is family ties and relationships in this tiny, small and overcrowded place, and there's a lot of people who want to keep it that way," she says. What's frowned upon, she suggests, are "troublemakers" and "people who rock the boat." But for some young LGBT Hong Kongers, Gigi Chao is exactly the kind of "troublemaker" they need. "When Gigi came out, it really hit home for me," says Callie (not her real name), a 21 year-old lesbian woman whose parents, like Gigi's, are well-known Hong Kong celebrities. "When my parents saw Gigi, they saw this person who is established, who has a really good career, is still living her life to the fullest -- and that made them realize that I can have that, too. "Gigi definitely showed the LGBT community that there is hope, and we're moving in the right direction." For Callie and many others, Chao has become a "symbol" of the city's growing movement. Still, Chao says life may not be as easy for members of Hong Kong's queer community who lack her celebrity status. "A lot of people... come from a life of hardship and inequality, not just because of their orientation but all sectors of life, all facets. And to add one more -- their sexual orientation being another disadvantage they have to face, that's the part that makes it more difficult, and that's what we want to confront." Despite being thrust into the position of role model, Chao says she does not claim to be a "leader" or an "activist." "I am who I am, and I speak for myself and myself only," she says. "All that's happened is I've been given a voice, and people seem interested in what I have to say." Watch the full interview with Gigi Chao on Talk Asia next week.